Students need to make connections to grow their schemata. They connect what they are learning to what they already know. In reading they can and should connect the text to themselves, the text to other books, and the text to the world around them. They need the opportunity to articulate these connections. This is also true in vocabulary development. Students need to seek connections among the new words they are learning. Sometimes connections are obvious and words can be grouped or sorted together into topics. Other times it seems as if there is no connection. It is then that creative and critical thinking are needed. How do I connect a quill to a pizzeria? I guess it is unlikely that the pizza guy would write my order with a quill, but then again—that’s a connection! The book I am currently making a project for, Just Being Audrey by Margaret Cardillo, has both awkward and elegant connections. It needs to become obvious to kids that words’ “oppositeness” is a key connection. 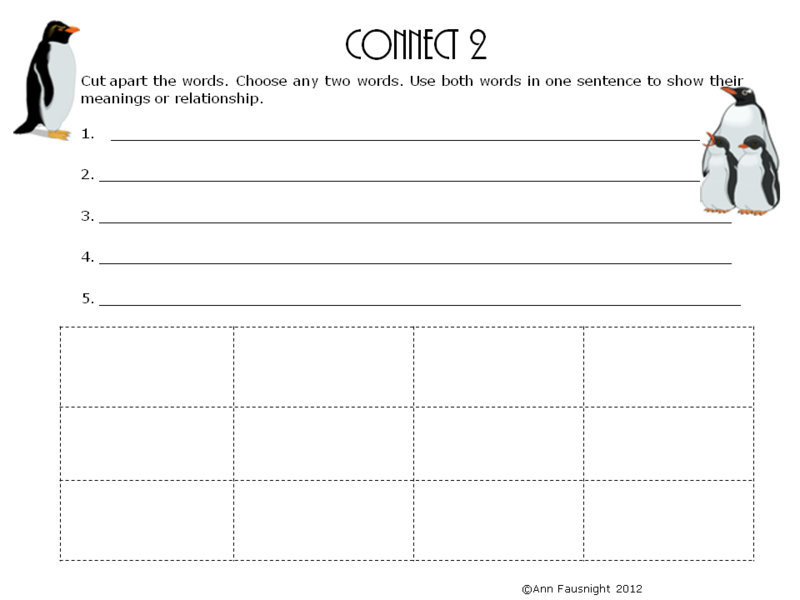 I am including one of my favorite strategies, Connect 2: Just write words you are currently studying. Have the kids randomly use 2 to make connections. This lesson needs to have conversation, whether the kids work as partners, teams, or the the whole class does several examples together. The struggling learners need a chance to have the process modeled. The successful learners need a chance to use their creative and critical thinking. Other strategies are available at my TpT store. 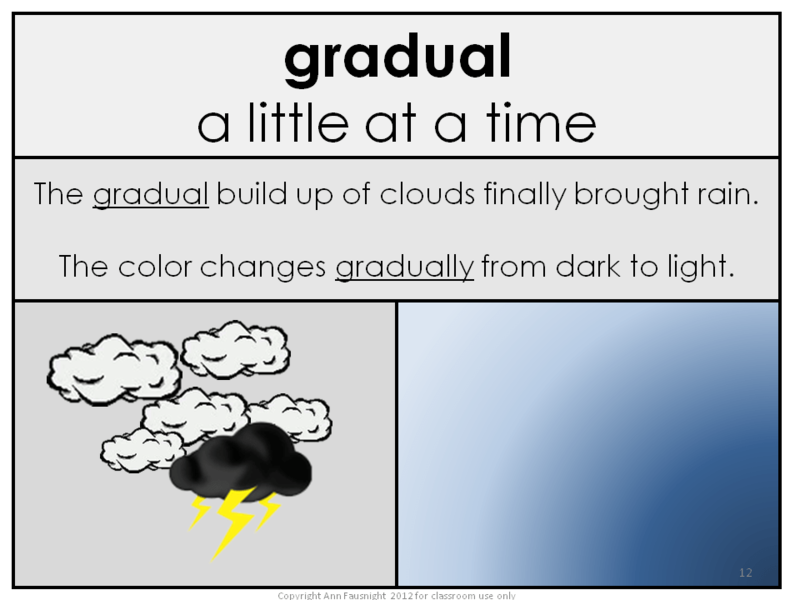 More Word of the Day also available at my TpT store. Find some unusual connections between words today! Laura Candler invited teachers at Teachers Pay Teachers to join a “link up” about a caring classroom. I wondered what I could say in relation to my theme of vocabulary development. After a short brainstorming session, I realized that without a feeling of being valued, students won’t be successful with any ideas presented in class. In other words, every topic must reflect a caring classroom. Students need strategies for success, personal connections, a chance to be heard, and to know they are valued and loved. Struggling readers need specific strategies for success, carefully chosen by close monitoring of their strengths and weaknesses. 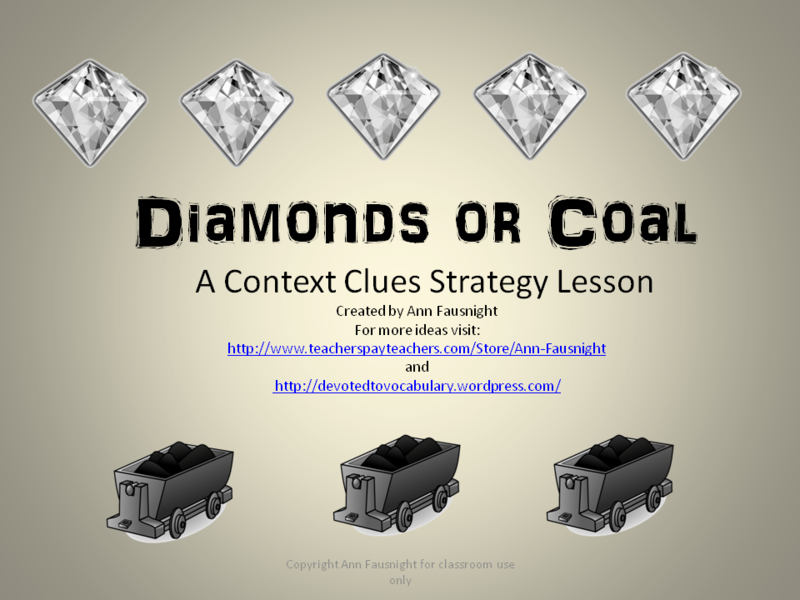 Those strategies are the types of things I want to talk about here on my blog. For example, lessons that teach them to recognize definitions, restatements, examples, comparisons or contrasts, descriptions, and synonyms or antonyms given with new words in the sentence or paragraph increase their ability to read independently. Everyone deserves to feel successful every day! During read alouds I often stop and ask students to make personal connections to a story. The connections can be as simple as a thumbs up, thumbs down about a character’s choice in the story or as complex as a chance to draw and write about the choice they would’ve made. Some favorite read alouds I use at the beginning of the year include Tacky the Penguin by Helen Lester (What makes you an odd bird? What makes you good to have around? ), Chrysanthemum by Kevin Henkes (What’s your favorite game? What’s your favorite meal? Have you ever felt like you weren’t wanted? What makes you wilt? What makes you bloom? ), and The Important Book by Margaret Wise Brown (What is something you know about an apple, a glass, a shoe … ? Tell about you, what is the most important thing about you?). It is so important that, throughout the day, students have a chance to be heard. We talk often with shoulder partners, face partners, and teams. Cooperative learning is an excellent resource for a Caring Classroom because students have so many opportunities to say what they think. My favorites are Line Ups (in the first week of school I do birthdays, number of siblings, and number of years at our school), Think – Pair – Share (this provides a great chance for everyone to be ready and then to share), and simple Mix-Match activities. 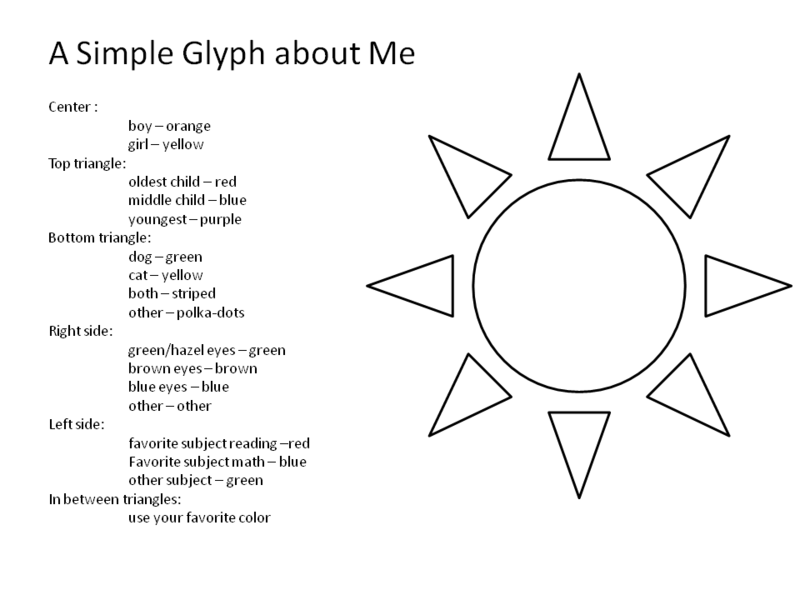 Graphing and glyphs are fun ways to incorporate personal information about students into activities. We graph eye color, birthdays, and how we get home from school (very important graph on that first day!). We make bioglyphs to post to learn more about each other. I’ve been considering an idea this summer, as a way to show students they are valued. It is called “The Best Gift.” My idea is to beautifully package a box with the shiniest paper and the sparkliest ribbon. Inside I would put my class list or a class picture. I would bring it into school on the second day and tell the class that yesterday I got the BEST GIFT EVER! But, I’m not ready to open it yet, I love how it looks too much. Every day I would mention it or say something about how special it must be. I would keep this going for a month or 6 weeks or longer. Then I’d start watching for the perfect time—when my class made me feel especially proud or maybe when I feel especially let down. Then I will open it and gush about how special they are and how much good and happiness they bring me. If I were to get another student before the opening I would bring another little box to join the big one, or I could secretly open the box and add him in. This would work for me because I have this odd quirk: I enjoy unopened presents more than opened ones. I don’t have any need or desire to know what is in the wrapping. I could tantalize my class forever. What do you think? Would they feel loved or would it make them frustrated? Please visit my TpT store. 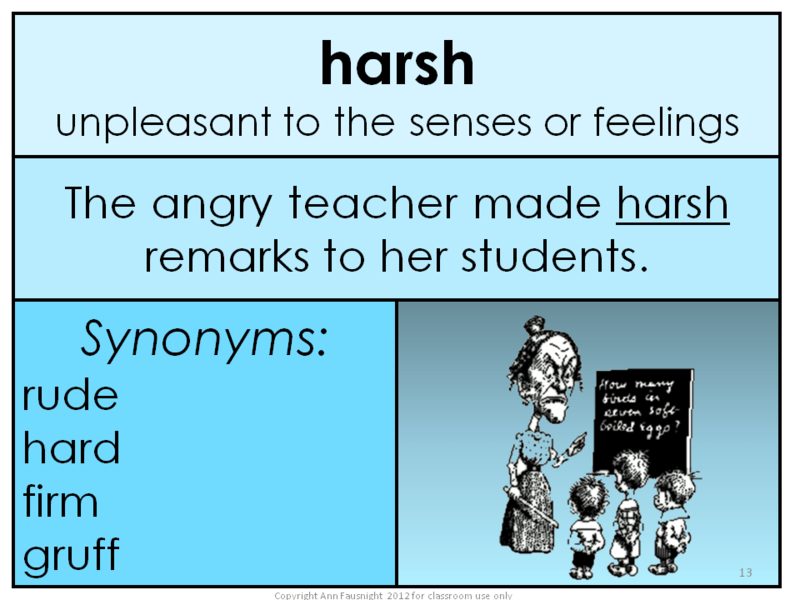 Teach synonyms. 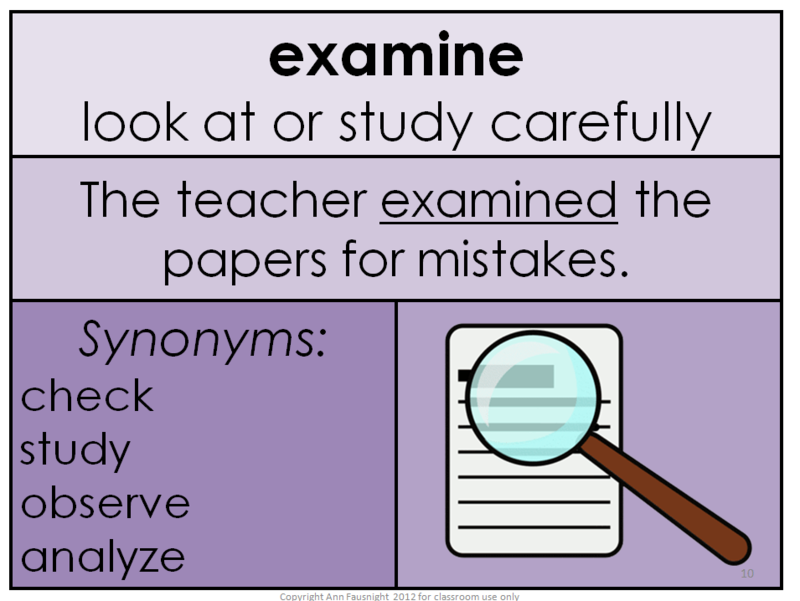 Provide a synonym students know, connect enormous to a simpler word such as large. Teach antonyms. 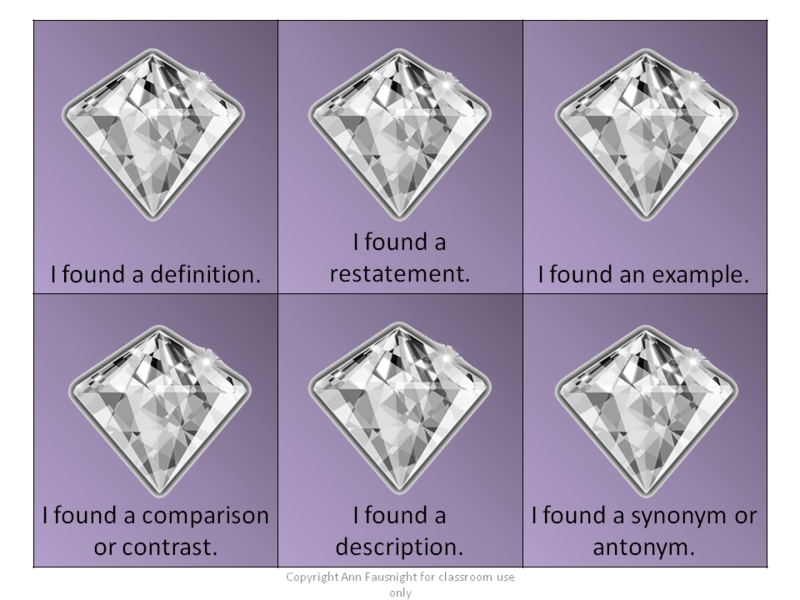 Not all words have antonyms, but thinking about opposites for those that do requires students to evaluate the critical attributes of the words in question. 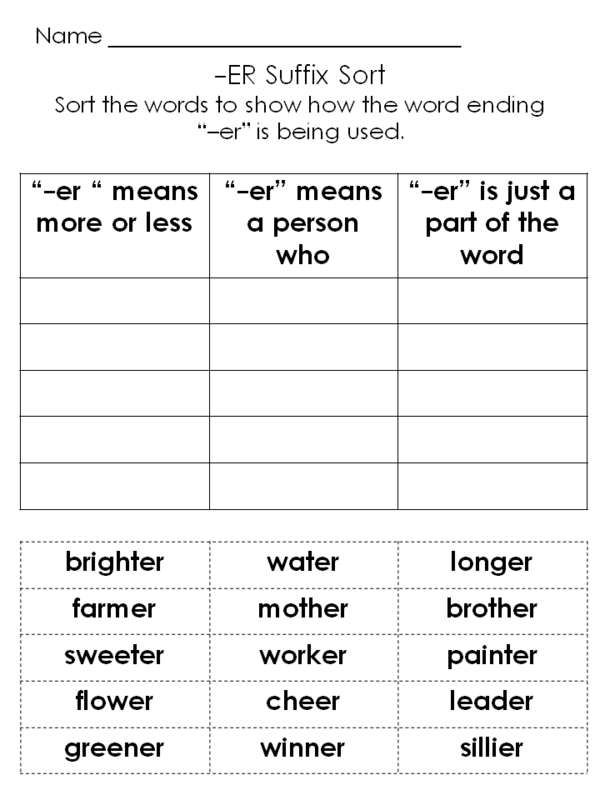 Teach word sorting. Provide a list of vocabulary words from a reading selection and have students sort them into various categories. Students can re-sort words into “guess my sort” using categories of their own choosing. Find more at my TpT store. Happy birthday to my brother, Joe! I love this quote’s boring vocabulary. It makes the ending that much better. And being married to a chemist, I do find the quiet wit an essential element. This reminded me of an “example/non-example” activity I often do in my classroom. Using a list of words, I write the words one at a time on the board, giving the class the opportunity to determine why each word belongs in the list where I placed it. Once they have determined the rule, I let them tell me where the next words belong and/or provide their own examples for the list. This Suffix Sort involves the -er suffix, which is not always a suffix. I create 3 lists: words that mean “a person who or a thing that,” words that mean “more or less,” and words where -er is just a part of the word. A few words fit into both category 1 and 2, for example “wetter” could be both “a person who wets” and “more wet.” This small skill can help grow vocabulary independence in struggling readers. Have a great Sunday. Listen for humor in words. 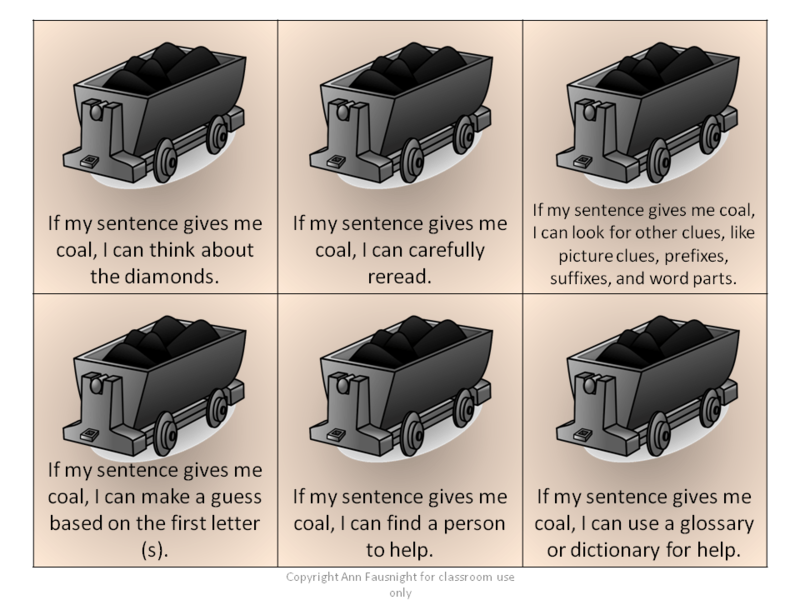 Is your sentence filled with diamonds (words that help you figure out the meanings of any unknown words) or coal (words that don’t help you understand at all)? Diamonds include definitions, restatements, examples, comparisons or contrasts, descriptions, and synonyms or antonyms given with the new word in the sentence or paragraph. We need to learn how to find each kind of diamond! They are valuable. What can we do about the coal? § Learn more about the diamonds, after all coal turns into diamonds given enough time and effort! § Look for other clues: picture clues, prefixes, suffixes, compound word, or word parts. § Make a guess based on the first letter(s). See if your idea makes sense. § Find help: a friend, parent, teacher, dictionary, or glossary, if it is a non-fiction book. 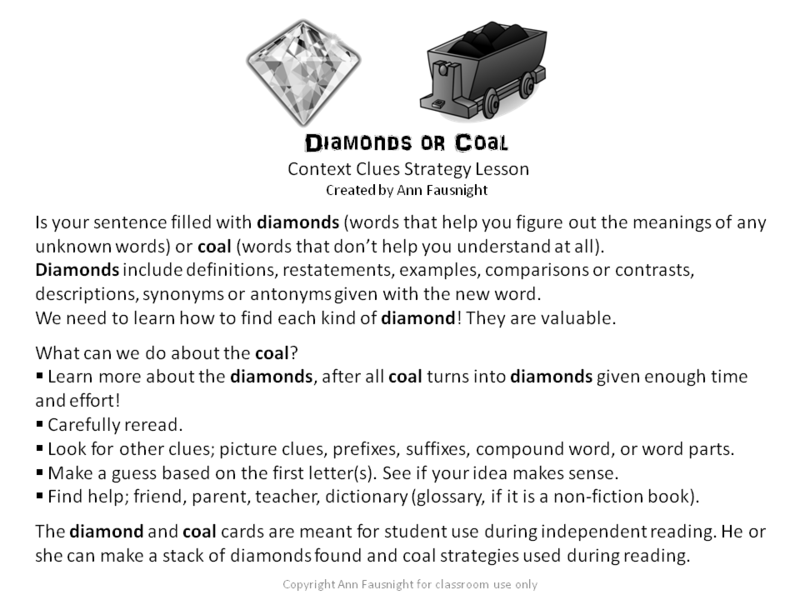 The diamond and coal cards are meant for student use during independent reading. He or she can make a stack of diamonds found and coal strategies used during reading, or the cards could be kept on a ring as a handy reference.